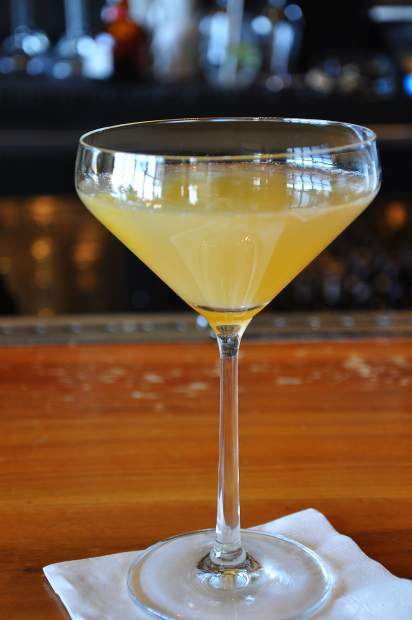 Lone Eagle Grille’s Pear Martini highlights that underutilized fruit flavor: pear. This week’s drink makes a strong case for the forgotten fruit: the pear. LEG’s Pear Martini gives its traditional fall season appearance the bird and lets us know that it’s down to party no matter what time of year. Like a mighty step from a T-Rex, that funny looking but delicious fruit shakes up this drink in a couple of ways. Absolut Pears vodka and Calvados pear liqueur provide the base, and are then mixed with simple syrup, lemon juice and real apple puree. The result is a surprisingly mellow but richly complex cocktail. The pear really strips down the lemon (dare I say it goes pear naked?) so it doesn’t overpower you. A little fruit karate chop at the end from the apple puree and you’re left with an aftertaste that you want to sit around and visit with for a while. I’m not sure why we don’t see pear more often. But while it’s not something you see all the time, when it shows up you’re usually happy to see it and most often it’s great — kind of like Boba Fett from Star Wars. I could see this being a perfect pairing for a porch at sunset after a long day’s work. Or, perhaps, your drink of choice used to toast the demise of the last Jedi Knight and his snarky buddy. Either way, you can’t go wrong — unless you end up getting swallowed by the Sarlacc. Sorry, Fett. Long live the rebellion! Lone Eagle Grille is located at 111 Country Club Drive in Incline Village, Nevada. It is open for lunch and dinner seven day a week, although hours vary. For information visit them online at http://www.loneeaglegrille.com or call 775-886-6899.